So, anyway, Committed is the follow-up. It… wasn’t the same as Eat, Pray, Love, which was what I was hoping for. This time, Ms. Gilbert explores the history of marriage and different marriage customs around the world as she tries to come to terms with marriage after her bad first experience, in preparation for her… rather unplanned… second venture into wedded bliss. However, it did make for some interesting reading. I enjoyed it, actually, and it’s probably something I needed to read, to maybe help me over some of my own skepticism concerning marriage (My divorce was nowhere near as bad as hers, but I still have issues, okay?). A worthwhile book, as long as you don’t go into it expecting it to be a repeat of Eat, Pray, Love. I can completely relate to your comments on eat pray love and committed. As you mention, very similar to my life as well and helped me a lot. 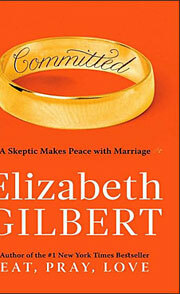 Committed is not the same as Eat, pray and love but still it is really worth reading.